I studied architecture for a while in college, and I've had the idea that some of the principals I learned about can be useful in designing games. Designing a building and designing a space you go through in a game are actually pretty similar. One simple principle used in architectural design in the differentiation of destination spaces as opposed to circulation spaces. 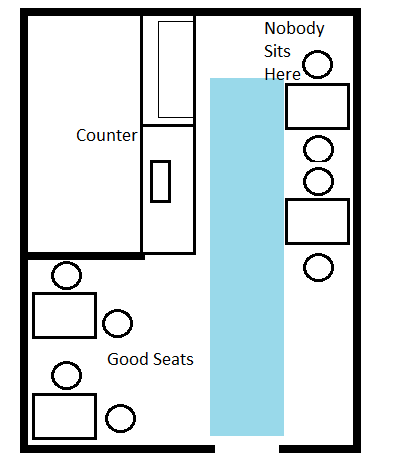 Basically- is this space one I go to do to something (congregate, cook, sit, etc) or a space I use to get somewhere? Is this a room or a hallway? The reason you’d care, as an architect, is people are uncomfortable occupying circulation spaces. In other words, people aren’t comfortable if their table is in a hallway. I’m going to talk about designing buildings for a little bit before we move on to video games, but bear with me. Many of us have been to coffee shops, and they’re a good example. Here’s a quick floor plan I made of like, every Starbucks near my house. It’s not a great drawing, but hopefully you can figure it out. The circulation space is in blue here. This space, right on the line between the door and the counter, is clearly where you walk once you come in to order a drink. It’s a hallway, basically. Nobody sits in the tables that are shoved over here unless it’s their last resort, because these are not in a destination area. The other tables, by comparison, are much more comfortable to occupy. This feels like a destination space, kind of like a smaller room off the hallway.. One big reason for that is boundaries. This area is bounded in on three sides with walls, it feels contained. It’s also not so rectangular, it’s more square. And this ability for people to see boundaries that separate their area from other areas makes people more comfortable there. Sometimes destination spaces are bound in and defined by walls, counters, or furntiure. Sometimes they’re only visual, like defining an area with a rug. They’re often more of a square than a long, narrow rectangle. Circulation spaces can also be defined with walls or maybe different colored floor tiles, and they’re often longer and narrower. I’ve again outlined the circulation spaces in blue (darker blue), and now the destination spaces in orange. These destination areas are bounded in on their corners and have narrow-ish entrances and exits. They feel more like rooms. And for the most part, the enemies are first placed on the map in the rooms when you enter the areas, leaving the hallways for walking through as a breather before the next room with an enemy or other activity. The way the designers in Minish Cap used bushes and varied width of the paths to section off areas allows for a much more varied trip through this area. Instead of a long hallway, it’s a series of different rooms connected by short hallways. This also builds in a little bit of pacing to the game, peaks of interest in the rooms, and lulls of calm in the hallways. One way to do this is just to break up a long hallway into a series of rooms, putting fences or trees to block in “walls” and “doors”, for example. It's important to remember how much of the map a player can see at once though. In Zelda 1, every section of the overworld was blocked off, as only once screen was loaded at a time. In Link to the Past, where the map scrolls, you'd need to be aware of how much of an area a player can see, and create "rooms" that are scaled appropriately. If they're too big, they may feel like open, boundary-less areas. I think if we pay attention to the kind of spaces we’re building, particularly in our overworlds, we can create a more interesting world to travel through, and one that gives the player peaks on interest and times of reflection. This is awesome advice for the mapping of a game. Thanks for explaining this! Yes ! I will definetely think about this in future maps. This is really smart, and I never would've considered it! Will definitely keep in mind for future games. Thanks. I'd like to do a series of articles leveraging my studies in architecture, but there is so much to do in life! I translated that article using Google a while ago, and it's very good advice. There were a few paragraphs Google didn't translate for me, but the main ideas came through clearly. The best advice from that mapping tutorial is "l'équidistance, c'est le mal", which translates to "equidistances are evil". (This refers to maps in nature.) This needs to be pointed out because most non-professional mappers usually do this in the wrong way, and that is annoying. Just read another great article about architectural principals (in this case, city planning) in level design. This one is centered around how the roads, nodes, and landmarks of Breath of the Wild make building a mental map easy. A good level always makes it easy to build a mental map, I think. I really liked their observations on differentiating regions by their Flora and fauna.